Yoga in Assisi. © Andrea Wyner for the New York Times. St. Francis was sighted on the front page of the New York Times yesterday. Travel writer Nina Burleigh wrote about a “new kind of pilgrim” in Assisi. These are people who come to Assisi for meditation, yoga, and various modes of eclectic spirituality. Burleigh is not quite right when she says that “until recently, most [pilgrims] were Catholic.” Protestants have been making pilgrimages to Assisi since around the turn of the twentieth century, with a few scattered examples earlier. I’m referring here only to those Protestants who actually called their journeys pilgrimages. There were already plenty of Protestant tourists. They, too, may has been pilgrims of a sort, but they were not so explicit about it. Still, this is an illuminating article. 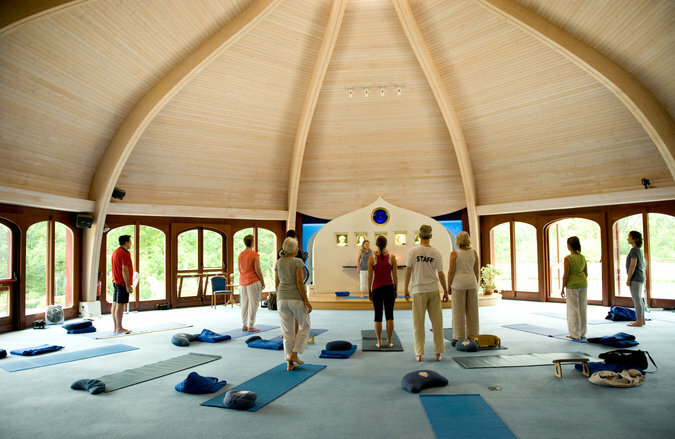 Burleigh gives particular attention to a large retreat center – some hundred and fifty people – set up by followers of Paramahansa Yogananda, the founder of the Self-Realization Fellowship. Yogananda claimed actually to have seen a vision of Francis, an unusual occurrence among Francis’s non-Catholic followers. That last quote came from a hotel manager. The article notes the confluence of commerce and luxury with the spirit of St. Francis. Pilgrims have always wanted to bring home tokens of their journey, just as tourists want to bring home souvenirs – as reminders, memorials, or carriers of special spiritual power. But there is irony here, since pilgrims often seek to divest themselves of material possessions and commercial transactions. Luxurious accommodations further blur the distinction between tourist and pilgrim. And I suspect the level of luxury is higher today than in earlier times. There’s particular irony in the fact that one luxury hotel is a former convent. But it’s built on top of Roman baths. It includes a spa, with waters for healing.